The capacity of a firearm magazine should not make anyone high. But given the hyperbole over “high capacity” magazines, I fear some politicians are positively stoned. Whenever there is a mad rush to legislation, accompanied by exaggerated sound bites, we at the Gun Facts project just have to take a closer look. Research is our drug of choice. Exactly what is a “high” capacity magazine? It depends on who you ask. Ardent firearm enthusiasts consider a 30 round magazine commonplace and can cite meaningful usefulness for 100 round mags. Some gun control supporters believe anything over six is excessive. As with “assault weapons”, “high” capacity is in the rheumy eyes of the politician. For sake of convenience, we will follow the two arbitrary legislative definitions of “high” capacity, namely 10+ or 15+ rounds. We do this so we can measure any alleged efficacy of such laws, but also because one of the common publicly available databases covering mass public shootings 1 lists in which events these types of magazines were used. This makes the math both reasonable and easy. There is no reliable and comprehensive database concerning the magazine capacity of guns used in crimes outside of mass public shootings (MPSs). Even if there were, there are gun crimes where guns are not fired (e.g. ATM muggings). If anyone knows of a solid database that denotes magazine capacity for guns fired in the commission of a crime, and what the crime was, we would love to get our mitts on the numbers. That being said, what we do know from sundry criminology reports is that for garden variety crime, magazine capacity isn’t an issue. The average number of rounds unleashed by criminals during a crime is between 2.04 for revolvers and 2.53 for automatics. 2 Hence, MPSs may be the only crime in which the capacity of the magazine matters. Given this alone, attempts to ban magazines of 10+ or 15+ rounds is an exercise in futility. Statistically speaking, such bans are meaningless. On a purely raw number basis, larger capacity magazines look terrible in terms of MPS deaths. The misleading table at the right summarizes the number of MPSs and the number of people killed with various magazine capacities. But as the Gun Facts project likes to remind people, the Devil loathes details. As other Gun Facts research (not yet published) has discovered, MPSs are increasing in frequency globally. The rate of increase of MPSs in the United States is actually slower than the rest of the world. But with the increase in the number of such events, we wondered if lunatics bent on mass murder were augmenting their armament. The event in Las Vegas was a vivid example of extreme lunacy and firepower (the shooter possessed 12 100-round magazines). What we discovered though is that 15+ round magazines in MPSs have been the norm since at least the late 20th century. Any increase in their rate of use appears to be strictly a byproduct of the slow rate of increase in MPSs in general. 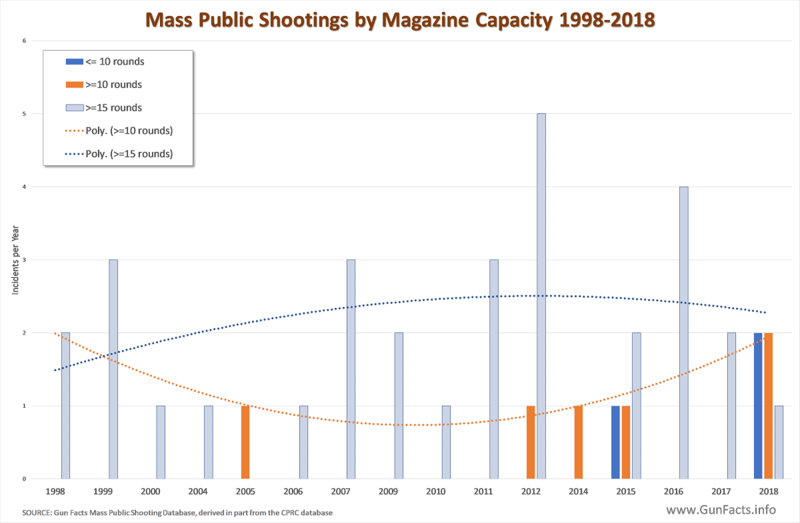 Since the number of incidents of MPSs using “high” capacity magazines is relatively static over time, we had to discover if they are inherently more lethal. As the argument for banning these magazines goes, “the less often you have to reload, the more people you can kill”. But as the Gun Facts project noted with our groundbreaking perspective on “cattle pen shootings”, the magazine capacity is secondary to the venue. Stated differently, fire from a 15+ round magazine into an empty room and the only thing you will kill is the furniture and your ammo budget. When we mapped MPS incidents and fatalities, we saw a distinct pattern. For <10 round and 10-14 round magazines, the average number of people killed was 8.0 and 7.1 respectively (yes, fewer people are killed using the larger 10-14 round magazines). The first interesting comparison point is that even including exceptional events (e.g. Las Vegas), the body count from shooters using 15+ round magazines was 11.9. Granted, this is 50% higher than the average for <10 round magazines, but numerically not a huge bump and is less than the magazine’s capacity. And given the relative infrequency of MPSs, the death rate is still a fraction of a fraction of a fraction of all gun homicides. The next interesting bit was how well the number of incidents involving 15+ round magazines fit with MPSs employing smaller capacities. In other words, in most cases, the shooter stopped murdering people long before he ran out of ammo in his first magazine. This leads rational people (a.k.a. ‘not your congressman’) to conclude that deaths from MPSs are more a factor of location and people density than the weapon type of the magazine capacity, which is where the Gun Facts cattle pen scenario research is leading. 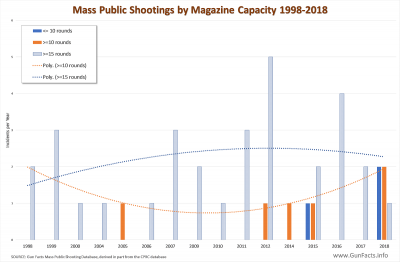 The third observation is that only eleven MPSs since 1998 in which 15+ round magazines were used – those with twelve or more people killed – accounted for just under 70% of the deaths in events using said magazines. 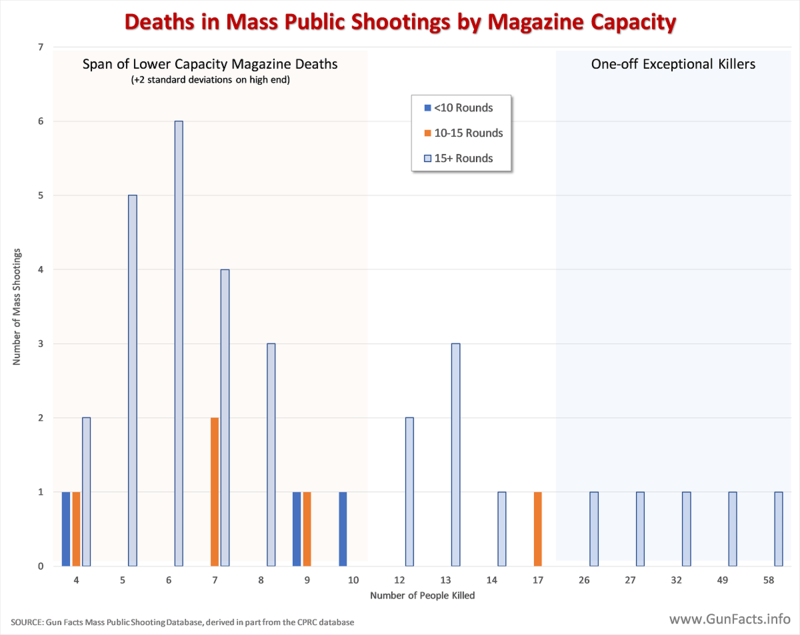 If we look at just the events above where the next category of magazine shows on the chart – events with 26+ people killed – they account for half of all deaths. 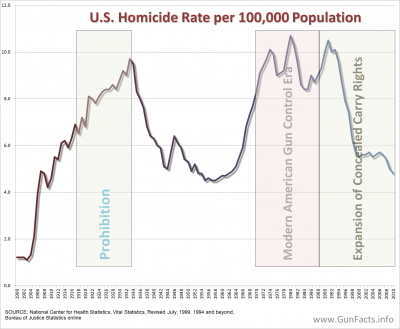 The point of these observations is that a small number of extreme events skews the death rate from 15+ round magazines. Without these over-the-top homicidal rages, you might not see a dime’s worth of difference between smaller capacity magazines and larger ones in terms of the number of people killed. Here is the point of this exploration. 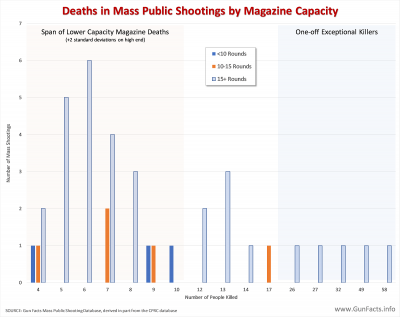 As the charts above show, magazine capacity is not a reliable variable in term of the number of people killed in MPSs. That 20 MPSs where 15+ round magazines were used resulted in fewer than 10 people being killed – within two standard deviations of the mean for lower capacity magazines – means other variables are likely more important. From the exceptional events – ones where many people died – all but one of the shooters had prior mental health issues, and all but one of the events occurred in a gun free zone. BUT, ALL OF THESE EVENTS WERE CATTLE PEN SCENARIOS. Will bans on “high” capacity magazines make any difference at all? Not really. Now, will a politician listen to numbers? I fear the current crop of legislators suffers from either mass delusions or mass innumeracy. Update #1: How Many Lives Savable? It occurred to us that it would be interesting to know how many MPS lives could be saved even if all 15+ round magazines were confiscated. Excluding the Las Vegas Country Music massacre, in which 100 round magazines were used and thus is a very unusual case, we can derive this number. First we exclude incidents where the death rate was within the two standard deviation range of smaller capacity magazines. The logic here is that the shooter stopped long before they reached the end of even a first magazine of ammo, and thus not having a larger capacity magazine made no difference. A maximum of 211 lives were at play. But as we see, the average body count using magazines <15 rounds was eight. We have to assume the shooter would have still gone on a rampage and used smaller capacity magazines. When you do the subtractions, 123 lives over 20 years were in play, or about 12 lives per year. And even this is purely theoretical and optimistic. One other point to make is the “time factor” involved in changing out a spent magazine. The amount of time required to drop and replace a spent magazine is minimal, at best, and even one not “well-trained” to do rapid magazine changes can accomplish that feat in less than two seconds. So, considering the amount of time spent shooting …. the difference between 100 rounds from a single magazine and 100 rounds from 10 round magazines is about 20 seconds. Then, consider the ‘functionality’ of any magazine of more than 30 rounds – THEY DON’T GENERALLY WORK ALL THAT WELL, and tend to jam – the amount of time required to clear a jam and chamber another round will pretty much negate any difference in the time it takes to fire 100 rounds. Then, consider the weight of a 100 round magazine and how ‘easily’ it can be changed. The point is not how many rounds there are in a magazine – the point is … THERE ARE BAD PEOPLE WHO DO BAD THINGS. Herding everyone into an enclosed area and preventing those people providing their own protection is one of the root causes of mass shootings. Virtually every ‘mass shooter’ chose the location based on ‘population density’, ‘target vulnerability’, and ‘shooter safety’. With the speed a “low capacity” (10 round) magazine can be ejected and a full magazine inserted, a “10 round” law has virtually no effect on the number of people a sick-o can kill. However, it does give the ILLUSION that politicians are “doing something” and they can spew their ACCOMPLISHMENT during their next campaign. I suggested to my friend, based on the unusually detailed data from the Baltimore Sun, that more than 80% of the dead were inner-city Blacks in their late teens to early twenties, and – based on DOJ Bureau of Statistics publications – a similar percentage of those convicted of murder were Blacks of a similar age group. I asked my friend, were the opportunity to arise at the vigil, if she would ask the Congresswoman to respond to the numbers. She is an activist for Pelosi. The invitation to the vigil has been the last I’ve heard from my friend. What I mean by all this are these several points. First, I hazard the guess that, say, 80% of those 23 hundred murders, the incident was a 1-on-1; and, further, that the median rounds fired were less than 3. Second, of further interest, the municipal government in each of those cities has been, as has been their respective state governments with little exception, dominantly Democrat for decades and generations. Third, the media and the politicians on all sides seem interested only in those murdered in the spectacular mass public killings – nearly all whites – and not those murdered one by one in everyday life – nearly all Blacks – in the impoverishment of decayed urban cores of Democrat cities. As to my invented term of genetic political Progressive, I mean that there is in fact a genetic basis for some or much of one’s beliefs. Replicated studies of behavioral genetics – beginning with the watershed Minnesota University study of identical twins separated at birth and raised in distant adoptive families – find very strong behavioral likenesses between the twins – political beliefs, preferences in music, colors, and such else – and often incongruent with the families in which they were raised. I fear that what this means is that much of the influential anti-gun players are – not kidding – simply brain-wired that way. My newest interest is studying belief systems – how they are acquired, codified, propagated, etc. This spans religion, politics, and marketing fields. One mode of belief maintenance is that people believe what they want to believe. Since a gun can (and arguably should) be frightening, people who lack experience with guns codify their belief systems around a negative response the guns in general. This in turn leads to confirmation bias, etc. Add to this that many belief systems are acquired, typically from parents but also from friends, the surrounding community, church, etc. If one is raised in a center-left home in San Francisco, they are provided a set of beliefs from birth that will also be center-left (and if you are raised in a center-right home in Dallas ….). Where propagandists and marketing pros come into play is not by convincing someone to believe something, but to attach to a belief system and to amp-up the targets. Get enough people with a belief shared system to be vocal, and it looks like a movement (Hitler was good at that craft). The “genetic political Progressive” and a fair number of anti-gun people are a product of such environments, inculcated belief systems and a little propaganda. This is not to say they are dumb or evil. It takes a fair amount of courage and skull sweat to question your own beliefs, especially ones you were raised with. Banning “high capacity” magazines from the law abiding populace is ludicrous thereby allowing them to be vulnerable in protecting themselves. Secondly, not every shot will hit its target, in fact, the probability is that out of 10 shots, maybe half will miss; therefore, this ban reduces the chances of survival of a good man with a gun against a bad guy with s gun! One other thing that I think is extremely relevant to to studying this is the response time from when the first round is fire to the time that the attacker is engaged and neutralized. My theory is that we will find that the number of casualties is more directly correlated to the time it takes to engage and neutralize the attacker. Interesting. I suspect the raw data could be gathered. If you are willing to take on that task and add a column to the Gun Facts Mass Public Shooting database, I’ll run the numbers.